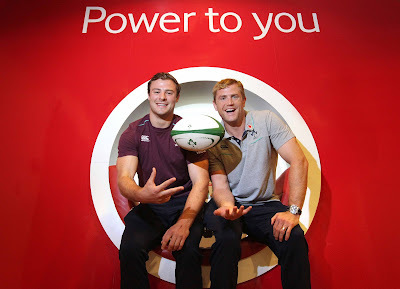 Vodafone Ireland today announced Irish rugby players Robbie Henshaw and Jamie Heaslip as brand ambassadors to promote Vodafone’s partnership with Irish rugby. 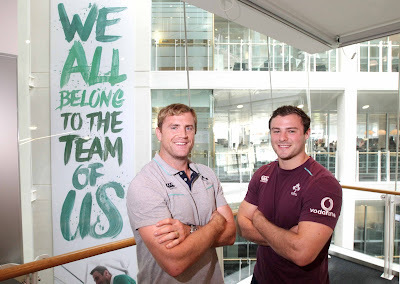 Vodafone was revealed as the main sponsor of the Irish rugby team in June of this year and launched “Team of Us”, the brand’s marketing platform for the sponsorship. “Team of Us” is inspired by the importance of the collective in Irish rugby. We are at our strongest not when working as individuals but as a team. That team includes the 15 players on the pitch, but also their support network of coaches, doctors, physios, backroom staff, families and friends and of course the 6 million fans on the island of Ireland that come together to support Irish rugby. Together we are all part of the “Team of Us”. Vodafone will be working with both players to create events, exclusive content and unique experiences that will bring Vodafone customers and Irish rugby fans closer to the team. Speaking at the announcement, Anne Mulcahy, Head of Brand Vodafone Ireland said; “We are very proud to be working with Jamie and Robbie. At its very nature Irish rugby is uniquely inclusive. Supporting the team brings the whole country together and this mirrors exactly what our business does in connecting people around Ireland and further afield. “Vodafone has a proven track record in sponsorship and our ambition is add real value and enhance the experience for Irish rugby fans. We have already invested in infrastructure improvements in the Aviva stadium that will provide fans with access to a world class network services on match days. “Our aim is to bring supporters even closer to Irish rugby and the players are central to this. We have innovative plans to collaborate with Jamie and Robbie to create unique events and experiences that demonstrate a real insight into Irish Rugby and create the most interconnected team and fan base in the world”. In the coming week’s Vodafone will be announcing their full line up of activation plans around the Guinness Series including the #TeamofUs Shirt Swap where Vodafone will be giving their customers the chance to get the new Ireland jersey for half the price. Keep an eye on the Vodafone Ireland Facebook page for further details.